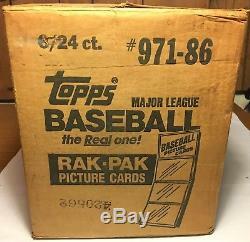 Here is a great 1986 Topps 6-box factory-sealed rack case, which has 6 rack boxes of 24 unopened packs each. Each pack has 48 cards, so that's 6,912 cards in the case! Case has some minor storage wear, but the top and bottom remain tightly sealed from Topps. Look for a great assortment of. Stars and Hall of Famers of the mid-80s in these packs, including Rickey Henderson, Nolan Ryan, Roger Clemens, Don Mattingly, Pete Rose, George Brett and many more. 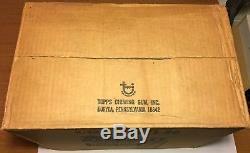 Be sure to check out my store for many other great unopened boxes and sets. 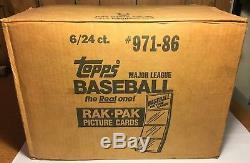 The item "1986 Topps 6-box rack pack case factory-sealed (6/24 ct. Packs 6,912 cards) HOF" is in sale since Saturday, December 29, 2018. This item is in the category "Sports Mem, Cards & Fan Shop\Sports Trading Cards\Baseball Cards". The seller is "certomatic" and is located in Quakertown, Pennsylvania. This item can be shipped worldwide.